Antoine de Saint-Exupery once said, "A pile of rocks ceases to be a rock when somebody contemplates it with the idea of a cathedral in mind." This is a quote that I often reflect on during my pursuit of globally-focused medical device designs and innovations; it inspires me to look at the objects around me in new ways to invent medical device solutions that are affordable and applicable worldwide. "A toilet plunger ceases to be a toilet plunger when somebody contemplates it with the idea of a revolutionary wound healing device in mind." I carried a toilet plunger with me for over a year of my PhD in mechanical engineering at MIT. I never thought that I would say, "a toilet plunger was a part of me," but in a strange way, it was in every way a part of me. After a while, I forgot that it was even there, and nobody else seemed to notice either, which is EXACTLY what I was looking for! You see, the toilet plunger (its long handle removed) was connected to a tube that was in-turn connected to a special tape on my skin. I needed the tape to be air-tight on my skin for a 3-day period. Therefore, I would put the tape on my skin, compress the toilet plunger pump and live my everyday life. I would leave this on for 3 days or until the toilet plunger expanded with air that leaked-in under the tape. The tape design iterations for air-tight success went like this: first it lasted less than 1 day, then through 3 days of showering, then while also running daily, then through a soccer game as well, and soon after, I arrived at a limb-saving solution ... a solution to replace multi-thousand dollar, negative pressure wound therapy (NPWT) devices with a multi-dollar, simplified negative pressure wound therapy (sNPWT) device, called the Wound-Pump. NPWT is a gold standard for healing open wounds. It is the application of low vacuum to a wound cavity for a period of about one to four months, which has been demonstrated to speed the healing time of open wounds, lower the risk of life-threatening infection and reduce scar tissue. Particularly impactful, NPWT is the only bedside therapy that has been proven to actively heal chronic wounds that would not otherwise heal on their own: mainly diabetic, pressure and venous ulcers. However, since 1997, NPWT has been significantly limited to the developed world, due mainly to its high costs and technology barriers. Commercial devices cost upwards of $15 to 20K per device (or $100 per day rental); require up to 70 Watts of electrical power; need training for their complex computer interfaces; and are bulky in size and not easily portable. Even with these constraints, U.S. Centers for Medicare & Medicaid Services paid $164M for NPWT in 2007, and today, NPWT devices support a $1.3B U.S. and a $0.33B Western European market, due to its remarkable clinical results. Unfortunately, this large expense only treats less than 1 percent of the chronic, non-healing wounds in these markets. 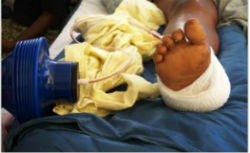 Image: Wound-Pump application in Haiti. Our Wound-Pump provides a global sNPWT device option, which was developed and tested in a global setting. It reduces costs by over 90 percent; requires no electricity; is simple to use; and is ultraportable: sized smaller than a soda can and weighs less than 0.5 lb. Under the leadership of Dr. Robert Riviello from the Brigham and Women's Hospital (BWH) in Boston, MA, the Wound-Pump was applied during the 2010 Earthquake Relief Effort in Haiti. It was specifically requested for this effort since there was a lack of electricity and caregivers were overwhelmed with wound care needs. Then, in 2011-2012, Dr. Robert Riviello and Dr. Gita Mody (BWH) led a multi-center field study in Rwanda, which was approved in both the U.S. and Rwanda. This formal study proved the Wound-Pump's safety and functionality and verified its applicability in low-resource settings. The response to the Wound-Pump technology has been positive during these field applications from both caregivers and patients. In addition, since the earthquake relief, over 2000 caregivers have reached out from over 90 countries, inquiring about the Wound-Pump. By launching WiCare, it is our goal to be able to fulfill this global need. "For-profit companies should sell products for as much as possible, maximizing profits in the U.S., and then donate down-the-road," suggested an investor in medical technology companies. The WiCare team wants to prove that you can both help people around the world, including those in the poorest settings, and generate revenues. Is there a large investor out there that is willing to make that bet? The Hult Prize is one organization that successfully makes this wager year-after-year, and we are thrilled to be finalists in the 2014 Hult Prize. The Hult Prize presented a unique challenge for our team: we had to develop a detailed business model around the toughest market -- addressing non-communicable diseases in urban slums. We had to prove with sound evidence that our medical device technology is truly a global solution to launch even in the most unpredictable and harshest environments. This challenge took our team and business plan to new levels, which proved to us the power of the Hult Prize competition. Through the Hult Prize, we are continuously challenged to maximize sustainability and impact; now, just thinking of what WiCare is capable of in the future gives me chills. When the MIT WiCare team was announced as the Regional Hult Prize Finalist in San Francisco, CA, I was extraordinarily moved and excited ... it is amazing to be part of such a world-changing initiative! Our team (Cody Gilleland (USA, Texas), Khadija Jallow (Gambia), Shweta Sharma (India) and Danielle Zurovcik, PhD (USA, Pennsylvania)) is truly honored. We are excited for the upcoming Hult Prize Accelerator Program in Boston this summer. Looking at the future of WiCare, the Wound-Pump and our global devices in the pipeline, there are a lot of great things in-store for WiCare! This post was produced by The Huffington Post and the Hult Prize, where teams of college and university entrepreneurs compete for $1,000,000 in funding for compelling social business ideas. The posts are written by the "Big 6" competition finalists. To learn more about the 2014 Hult Prize, please visit here. Read all posts in the series here.